NASA caretaker. He was so dumb he was replaced. His replacement reinstated our club to again fly at Plum Brook. I was making touch and goes with my Sonic Cruiser designed by Hal DeBolt in 1961. Stu Warner took the photos with my cheap Nikon digital camera. Also flew my 1/2A Airfoiler which Hal DeBolt designed. Hal used seven degrees incidence in the wing and five degrees of positive incidence in the stab. He thought this would eliminate down-thrust for the engine. 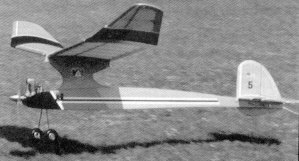 Hal designed the model for a glow 35 engine. The set up did not work for the 1/2A Texaco version. I installed two washers behind the engine and today the model under power indicated it will require some more down thrust. The model also stalled in the glide. Stu told be to remove some of the incidence in the wing. I am thinking of adding nose weight; it is easier to add weight. The color scheme is hard to see in a blue sky. The model has a single, retracting landing gear actuated by a rubber band just like the original.